It was gathered that passengers were forced to wait for two hours to return after South African officials identified a bag believed believed to housing a bomb. The airport’s international arrivals hall was evacuated around 0915 GMT after the errant baggage was spotted and airport users were unable to re-enter until after 1115 GMT. Airport spokeswoman, Leigh Gunkel-Keuler in a statement apologized. 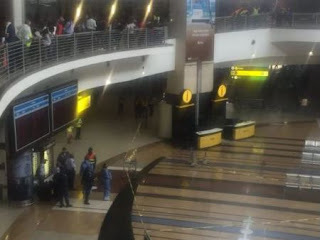 The statement reads, “To ensure the safety of passengers and customers in the airport terminal building, people were evacuated from the area. “(The police service) has now provided airport management with the assurance that passengers and customers can now return to the airport terminal building. “The incident caused delays to several flights although the airport had largely returned to normal operation. More than 20.6 million passengers use the airport every year and 41 airlines serve the facility according to its operator, Airports Company South Africa.